Business intelligence software is a powerful, yet complicated technology. Selecting the best BI platform for your business takes substantial legwork. It’s essential that your selection process, including your request for proposal (RFP), is managed well. Your business intelligence RFP will serve as a guide to yourself, your team and your management for selecting the business intelligence software that will most greatly benefit your company. Building a request for proposal involves careful evaluation of the current state of your business intelligence processes and the features required to improve those processes. When you are ready to create a business intelligence RFP, we recommend the following process to make sure you execute the RFP most effectively. As stated above, RFP is an acronym for “request for proposal”. Basically, an RFP is the plan for software implementation that is presented to upper-level management to be approved. An RFP takes your budget, time constraints, desired features and implementation goals into account to form a complete picture of all factors involved in adopting a new system. Compiling all of these elements to form a business intelligence RFP is intended to be informative for management in the final stages, but the process of building an RFP is illuminating for the creator as well. The making of a BI RFP involves contacting vendors and starting a dialogue regarding your requirements. As you discuss your business’s needs with potential vendors, your conversations may uncover additional wants of which you weren’t initially aware. A vendor may offer a feature you’re unaware of, or speaking with them may sway you on some items you were initially on the fence about. A request for proposal is more of an all-encompassing software implementation plan, but there are other, more specialized requests you may create during your system selection process. Requests for information are not as detailed as requests for proposal and are generally a beginning step in the process of software selection. RFIs are more of a broad-scope request for vendors to explain the overarching benefits of their product. An RFI may be useful to businesses that are in need of a new system, but not aware of a solution. Requests for information usually consist of explanations of need, with little knowledge of features that are most helpful. An RFI is usually a starting point for businesses with little awareness of available options. Another alternative to the standard request for proposal is a request for quote (RFQ). Requests for quote outline all of the logistical consideration of choosing a new BI system. Pricing, deployment options and other infrastructure-related inquiries are included in an RFQ, along with additional details not related to features. Sending out an RFQ can help you narrow down your shortlist of vendors based on which one will make BI software implementation as quick, seamless and budget-friendly as possible. The responses to your BI RFQ that you receive from vendors will detail elements which will become important toward the end of your selection process. A request for quote asks vendors to provide a plan for the final pieces of software adoption. A request for proposal, at the core, is an informative piece about your business’ software needs as well as persuasive material used to gain the approval of management to begin a software implementation project. First, a key component in building and managing a business intelligence RFP is defining your requirements. We recommend managing and collaborating on your BI requirements, allowing all decision makers involved to list and rank their key requirements. Our comprehensive BI RFP template is a great starting point. 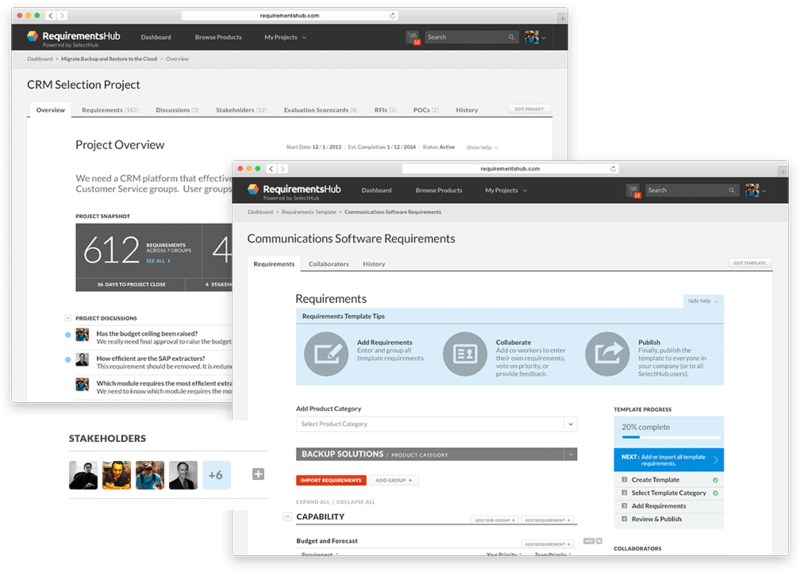 RequirementsHub provides the tools to begin building your RFP and sharing with stakeholders. Cloud deployment, data warehousing, integration capabilities, reporting and dashboards are features common to BI. You’ll want to define your specific requirements, as well as prioritize them with input from all stakeholders. For business intelligence software specifically, data management capabilities are a major component of choosing a vendor. In addition to standard features such as ease of use and integration abilities, it is essential for BI software shoppers to emphasize finding a vendor that can handle the amount and type of data their system will be processing. Data management considerations relate to connectivity as well. You’ll need to find a vendor that can connect to your company’s databases, pull data from third-party programs and seamlessly mesh with your current data infrastructure. Once you’ve established and ranked your BI requirements, integrate them into your formal business intelligence proposal. Create a professional-looking RFP document that includes your project goals, an intro to your organization and the requirements you’ve outlined. This can be done on your own or with the assistance of an RFP platform. An RFP platform provides the benefit of assisted organization. Using a tool for RFP creation can guide you through the process and ensure all components are included. After preparing your formal BI RFP document, you’ll want to shortlist and submit to the vendors you are most interested in receiving a BI proposal from. Shortlisting involves the evaluation of your feature requirements, as well as parameters regarding budget and implementation plans. Based on these factors, you can narrow down which vendors will be the best solution for your business’s needs, and will facilitate the adoption process with streamlined integration abilities and customer support. Sending your business intelligence RFP via email is most common. However, an RFP management platform is also an option to manage sending your proposal and gathering vendor responses. As in the RFP building process, a proposal tool will maintain organization of your chosen vendors and help you stay on task during the entire vendor contact process. Whichever path you choose, make sure you include all the vendors you are interested in. 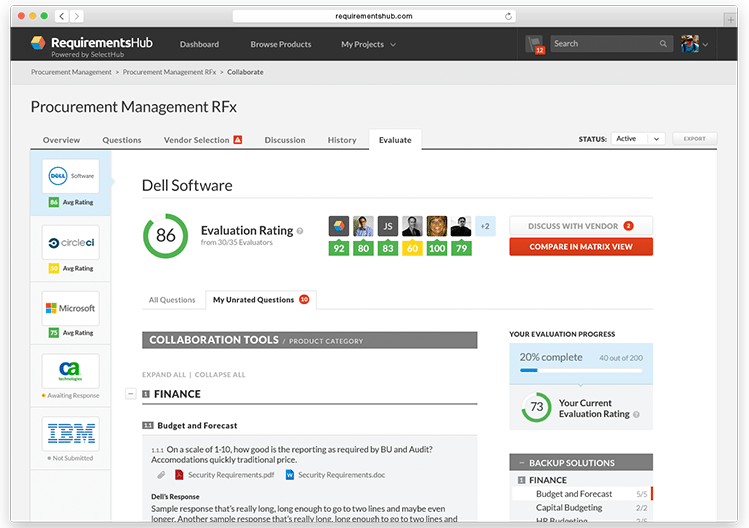 View potential vendors and invite the feedback of your team with SelectHub’s collaborative platform. Once you share your request for proposal with your chosen business intelligence vendors, you will begin receiving responses from those vendors. Their responses will provide answers to your questions regarding available features, user support options, pricing, implementation procedures and more. Based on their responses, you can narrow down your shortlist and decide which vendor is the best fit for your organization. 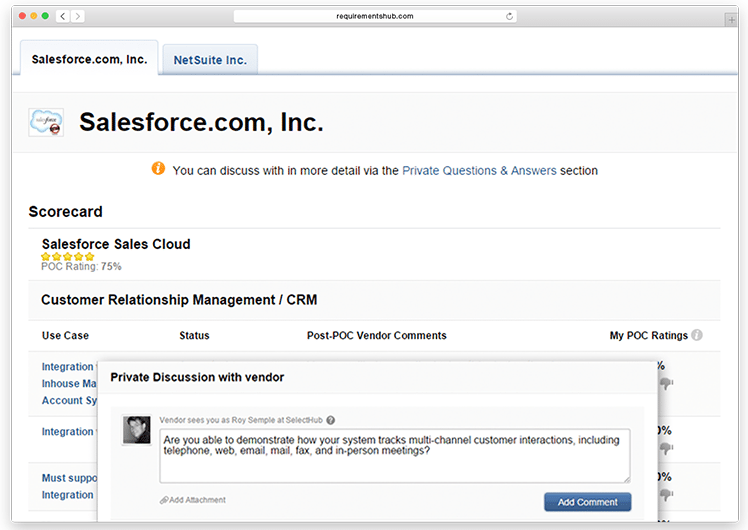 As the vendor responses arrive, you can either reply to each vendor as they get back to you, or wait until everyone has contacted you. The benefit of replying immediately is catching any vendor questions that are attached. If you don’t catch these questions right away and have waited to gather all responses first, you’ll delay the selection process. Also, waiting to tabulate all responses tends to lead to biases that can negatively affect choosing the correct BI platform for your organization. After reviewing all of the responses, you’ll want to move forward with the BI vendors that have best met your criteria. If you are still deciding between a few different vendors, the next steps would include getting demos (if you hadn’t done that prior to shortlisting) and engaging in proofs of concept. A proof of concept is essentially a demonstration of the business intelligence software’s ability to complete a certain task. Both the presentation of demos and proofs of concept allows you to see the software in action. Real-life examples of system capabilities will help you imagine the software in your everyday work, facilitating a final decision. Review your RFP with vendors, request demos and discuss pricing. Once you’re satisfied with a vendor’s demo and proof of concept, you’ll move to the pricing, contract negotiation and finalization. Your shortlist is likely narrowed down to at most three vendors, and these elements are usually the deciding factor in software selection. Pricing can be a huge differentiator for software buyers. A vendor can have all of the features you need, but if it doesn’t fit into your budget, implementation is simply not plausible. If you have already chosen a vendor at this point, these decisions are the next steps towards adoption. Speaking with your vendor choice about your contract with their company will finalize the details of implementation. Many vendors offer support during the installation of their software, as well as training to get your workforce accustomed to using the tool. You can create a plan for bringing the software into your organization, and discuss how the vendor will assist in the process. Running a business intelligence RFP project requires attention to detail and patience. We recommend using a platform to manage the process of creating an RFP — you’ll save 50 percent of the time it normally takes to complete an RFP project. The assistance of a sample business intelligence proposal template will help you stay organized and focused during the building of your request for proposal. Maintaining organization will also help you make sure all of the necessary elements are included in your RFP. For best results, you need to consult all stakeholders. The input of upper management, team leads and end users will give you a complete portrait of the requirements for business intelligence software. Speaking with everyone involved and focusing on the details will ensure a successful RFP and system implementation experience. Plus, choosing a universally satisfying solution the first time around decreases the likelihood of having to replace your business intelligence tool in the near future. Do you have any successful RFP processes you would like to share? Tell us your thoughts in the comments. I am a BI professional (MBA/IT) contemplating whether to work for a traditional company implementing BI, a straight up BI company or a BI consulting company that assists in the implementation process. I feel my advantage is that I have lived the business ‘and’ the IT world so I know what it takes to come up with super BI solutions. So, no matter where I end up, the idea of a Business Intelligence RFP Template and Guide will be more than beneficial. I’m always looking for tools/ideas to get ahead in this fabulous BI game!